For several weeks last year, the world was focused on Rome. Broadcasters from around the world converged on the city to cover the events surrounding the resignation of Pope Benedict XVI and the selection of his successor. Existing cellular towers were overwhelmed with traffic on the key celebration days, when more than 500,000 people flocked to the Piazza at St. Peters Basilica, making it difficult to stream live video with minimal or no bandwidth available from the cellular networks. Fast-forward one year to February 2014 and the eyes of the world were on Sochi, Russia and the Winter Games. The worlds broadcasters and official broadcast rights-holders had to transmit live coverage, as well as recorded video for later broadcast, from locations that were impractical for electronic newsgathering (ENG) vehicles to access and where local cell networks were heavily congested. As any news professional knows, the ability to get this kind of coverage whenever and wherever its happening can be a critical differentiator in a competitive business. ENG crews typically use satellite and microwave trucks to cover live news, sports, and other events from the source, but maintaining costly satellite and microwave vehicles is a major expense. At the same time, transmitting live video via satellite and microwave has its limits depending on the weather, the terrain, and other circumstances. For example, in windy conditions, satellite trucks cannot put the dishes up for safety reasons, with other atmospheric conditions, the signal may degrade, resulting in a drop in bandwidth and an interruption in the transmission. In other instances its just plain difficult to get a truck or a crew to the event in the first place because of crowds, the landscape, safety concerns, or any number of other factors. In situations like those, where conditions are far less than ideal for on-location newsgathering, ENG crews simply have to get their ENG vehicles as close to the action as they can and hope for the best, which is not very reassuring for anyone involved. Cellular bonding technology was meant to overcome each of these examples of transmission barriers and reinvent the way news organizations cover live news and events and in some situations, it has. The technology isnt just an alternative to satellite and microwave transmission but also a powerful adjunct to it when pure traditional approaches might not work. However, most cellular bonding systems fall short when the cell coverage is less than adequate. For example, when the bombs went off during the Boston Marathon last year, cellular networks became overwhelmed, inhibiting the effectiveness of a bonded cellular solution and therefore broadcasters ability to transmit live video from the scene. Dejero is addressing this challenge with technology that bonds cell networks with any combination of Wi-Fi, Ethernet, or satellite networks. This patent-pending Intelligent Connection Management technology uses the best of all available connection types to provide maximum throughput and optimal picture quality for each transmission. Dejeros proprietary Adaptive Bitrate Encoding over bonded wireless networks enables the transmitter to use the entire available bandwidth and compensate for changing network conditions by automatically adjusting frame rate, resolution, encoding rates, and streaming parameters. Dejero offers an entire platform of products, known as the Dejero LIVE+ Platform, based on this technology. The products can be set up anywhere in seconds to broadcast live to television viewers, stream to the Web, transmit recorded video for later use, share video content with other organizations, or send files remotely meaning a broadcaster can capture a story regardless of location or conditions. In particular, field crews that lack easy access to an event can still get to the heart of the news using Dejeros LIVE+ Mobile App. 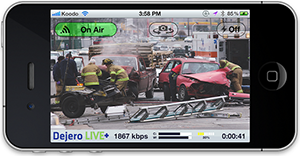 Available for both iOS and select Android devices, the LIVE+ Mobile App enables field journalists to transmit high-quality HD or SD live video from their smartphones and tablets. The LIVE+ Mobile App is an industry first, capable of bonding multiple wireless signals to stream high-quality video from the street to the television or Web. It aggregates both the Wi-Fi and cellular connections of iPhone, iPad, and Android devices, resulting in a higher-quality live video transmission with lower latency than a single connection would provide. In addition, the LIVE+ Mobile App also features support for interruptible foldback (IFB), enabling one-way, real-time communications to be sent from the studio to an earpiece worn by the on-air talent. That means seamless interviews with only 1.5-second latency. This bonded mobile application makes it possible to go live without the need for a camera crew or extra equipmentand even without a truckeffectively transforming everyone in the organization into a field reporter, from any place the news is happening. Whether reporting from the side of a mountain or the middle of a sea of protesters, broadcasters the world over have been using the Dejero LIVE+ Mobile App to be first on the scene, sending high-quality live footage back to their viewers that previously would have been impossible to capture.